Discussion in 'Celtic Chat' started by Dáibhí, Jul 3, 2014. Discuss Craig Gordon in the Celtic Chat area at TalkCeltic.net. It was a cracking shot. Right in the corner. He's never getting it. Chap won't hit a better one all season. All the usual stuff from guys who've never played a 90 mins 11 a side between the sticks. 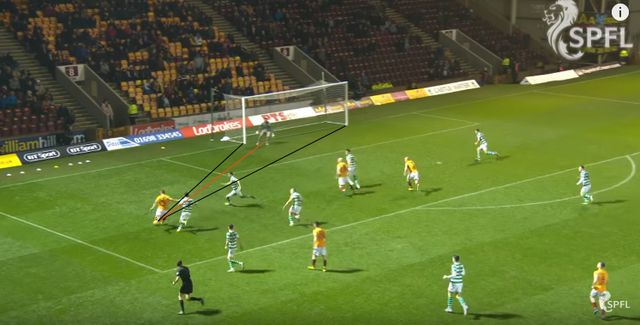 I'd be more critical of Griff missing a pen rather than this goal in the context of the 2 points dropped. Having said that, I'd be playing Bain. Bain is better wtih distribution. Not just accuracy but speed and decision making with the ball, I need to see a lot more of him to comment on overall decision making. Usually even if Gordon makes the right decision and gets the ball where he wants it to be, it's so slow. We do need a new gk. It was a good shot but if you think a keeper can’t position himself correctly to be able to cover the full goal from that angle I think you’re maybe the one that’s lacking in experience. Guarenteed training today Stevie Woods is going through him for that and quite rightly. trackebhoy and paulo123 like this. His strength is reflex, no time to think, saves. The rest of his game is up for debate. Puts us under countless pressure with his distribution. trackebhoy and \o/ like this. Quite right, no one in the history of football has ever scored against an experianced international keeper from that angle. There was nothing wrong with his positioning. The ball was right into the far corner catching the post, its put exacty in the only spot he could possibly score. If you really want to go after him for the goal then you could argue he was slow down. Having looked at it a good few times that might be something. Not positioning mate. I went in goal at half time once as we had no keeper and the game was 2 each London school's. Let 1 through my legs and arm's up ushering 1 by the post that snuck in (4-2)....yet I'd still of saved that last night..
Gabriel, Slaw and \o/ like this. When did I say it’s never happened? Experienced, very talented keepers are capable of making mistakes. Look at both David De Gea and Manuel Neuer at the world cup. He wasn’t covering the full goal and he was slow down. He overcompensates to the front post these days because he had a shocking habit of getting beaten there. His body shapes wrong, he’s too much towards the front post for me (again, overcompensating). Nobody’s saying that it wasn’t a good shot btw, just that it’s a save I’d expect my keeper to make. We need a keeper that will stand up in big moments like that. Unfortunately, Gordon rarely does. Do you think it’s pretty much impossible to save it from there? He was covering the full goal. Possibly slow down yes. It was very well hit shot, powerful and very accurate. I agree with the second part of this. I think you have got to credit the finish tbh.. Still want to see Bain start.. we’re a better side with him in it, it’s that simple. I just went and rewatched it, he wasn’t covering the full goal at all. He was practically crouching at the near post. If he was covering the full goal that is an easy save. A wee bit further away both his line and his post it’s an easy save and that’s where the keeper should be for me when he’s shaping up for a shot. He was slow going down because he was trying to hard ro cocer the near post. On another view, it’s pretty * abysmal all round. If the last is a ‘no’ and Gordon done everything right, why did he not save it? I do feel he was covering the goal. He possibly dives late as (I think it's) Jozo slides trying to block. He's in line with the front post about a stride of the end line. Any further forward he leaves too much of he goal to cover if the ball is squared. Any further off the line his front post is compromised. I never said Gordon did everything right, I answered no to the question of whether I thought it was an impossible shot to save, so I can't answer that one. We’ll need to agree to disagree, when he hits the shot he’s practically on the line hitting the near post. Slightly off his line, slightly further off the post, not leaving in towards the near post is where he should be. He’s not covering the square ball where he was either btw. Where I’d want him he’d have a clear shot at gathering the square ball if it was ever on between the keeper and defence. I’m rewatching it a few times to take your points in and the more I do the worst it’s getting. Do you have a gif I can watch, mate. Maybe you're right, but I don't remember it that way. As a keeper the attackers body shape plays a big role in your positioning. If the guy was positioned like I remember, then Gordon's positioning was right; but I'd like to see it again, because memory plays tricks. FWIW my first reaction was genuinely that it wasn't really Gordon's fault, but that a Boruc or Forster might well have saved it. Edit: just watched the highlights on YouTube and assuming the striker is right footed, Gordon's positioning is correct IMO. Having said that, he cracks it in with his left. Is he left footed? I assume Gordon will have been given a dossier before the game. That would be true if the attacker were directly facing the centre of the goal, which he isn't. Perhaps with these modern, light balls, this isn't a thing anymore; but when I was young, we were told (I used to play in goals) and I remember reading that we should slightly alter our position based on the attacker's body position. Gordon's position is exactly where I would expect it to be. Add to that that the attacker is on his left foot. If I were hypercritical, there is no cross on, so Gordon could have come out a bit more; but these are split second decisions we are talking about. Maybe this has changed in the modern game TBF. I know the ball has changed. Having said all this, I've now watched it so many times that I've noticed that Gordon doesn't read the attacker's gait correctly and so sets himself a fraction of a second too late. When he hits it, Gordon's centre of gravity is still a little too high. Small margins. I still don't think this is a terrible mistake, mate. It's just a really great strike. I can’t see the pictures mate but it sounds like you’ve got the jist. I was always told when it came to goalkeeping if you shape you’re body so that you cover as much of the goal as possible, close down the angles for the shot, then you’ve gave the attacker a harder shot. For me, he opens up the shot across the goal and the guy finds a perfect finish but if he wasn’t too worried about his front post (and I can see why he is it’s a know weakness) then he saves it. I finally got the links to work. A foot to his left and he could have been exposed by a powerful near post dig.. The boy hit a blinder and fair play to him, keeper not to blame for that one for me. I think maybe it has changed. I definitely remember this when I was young, because it was much harder to generate power across your body. But searching online, all I can find is references to the midline idea, exactly like you are thinking. Maybe with these light balls these days it is no longer a thing. I did find a very good image of a Bundesliga keeper exactly where you say Gordon should be, so I'm beginning to think I'm wrong. Aye, exactly mate. Just cover as much of the goal as possible so you can get across to the shot. Gordon has issues at his near post but so I think he’s overcompensating and then been beat with a belter of a shot. It's embarrassing that people are trying to blame him for that goal.